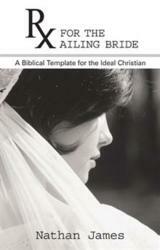 “I’ve long felt that the direction we have been given in our churches as to what the ideal Christian looks like is not supported in Scripture.“ It is this perceived incorrectness in doctrine that drove author Nathan James to pen RX for the Ailing Bride: A Biblical Template for the Ideal Christian (published by WestBow Press). James believes that today’s churches have shackled themselves to many Reformation doctrines not supported in scripture. With regard to salvation, two particularly detrimental doctrines have been Calvinism and Arminianism. Both of these have selectively filtered Biblical passages through their theological construct, effectively rejecting the whole council of God. After challenging believers to discard the shackles of Arminianism, James dedicates the bulk of his writing to encourage believers to follow the primary pillars of the ideal Christian as laid out in scripture. These are: 1) Seeking to be daily clean before God and filled with the Holy Spirit; 2) Operating in the body of Christ in accordance with the spiritual gifts bestowed to each believer; 3) Actively obedient to the commands of Christ. Nathan James is a serious student of the Bible and relishes his role outside of the theological elite. He comes from a layman's perspective on Scripture and is untainted by the bias often baked into seminarians. This allows him to take a fresh, straightforward interpretation of Scripture. Nathan is married to Melissa, his bride of 12 years. They have five children and have made their home in the Memphis area the past 11 years. WestBow Press is a strategic self-publishing alliance of Thomas Nelson, Inc., the world’s largest Christian publisher, and Author Solutions, Inc. (ASI) — the world leader in the popular self-publishing industry segment. Through this partnership, authors benefit from the rich publishing heritage of Thomas Nelson and the speed-to-market advantages of the ASI self-publishing model. Titles published through WestBow Press are evaluated for sales potential and considered for publication under the Thomas Nelson imprint. Thomas Nelson, Inc. continues to “inspire the world” with distribution of products in more than 100 countries worldwide. For more information, or to start publishing today, visit http://www.westbowpress.com or call (866)-928-1240. Follow us @westbowpress on Twitter for the latest news.